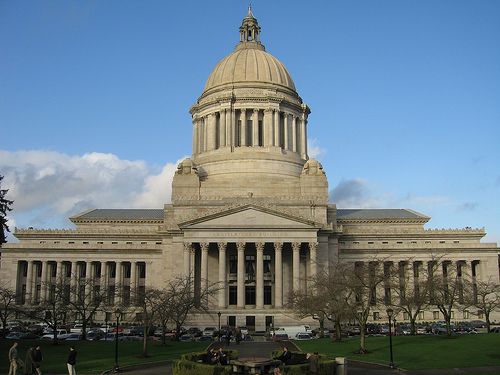 A bipartisan bill to abolish the death penalty in Washington passed the state Senate on February 14 on a 26-22 vote. SB 6052 now moves to the House of Representatives, where the chairwoman of the House Judiciary Committee has said it will be given a hearing. "Today, the Washington State Senate took an historic, bipartisan vote, passing Attorney General-requested legislation to eliminate the death penalty and replace it with life in prison without possibility of parole," said incumbent Democratic Attorney General Bob Ferguson. He, his Republican predecessor Rob McKenna, and Governor Jay Inslee had asked the legislature to take up the measure. The bill also received support from Republican King County prosecutor Dan Satterberg, and five Republican senators voted for its passage. During an emotional debate on the floor of the senate, Sen. Mark Miloscia (R - Federal Way) told lawmakers, "all people deserve to live." Miloscia, who is one of the bill's co-sponsors, said, "I'm here to ask for mercy, literally for the worst among us." Sen. Maureen Walsh (R - Walla Walla), another sponsor of the bill, said "We spend a lot of money, our tax money, appealing these decisions, and we have done this for many, many years. I have no sympathy for people that kill people, that's not why I'm doing this. I'm doing this maybe because I feel like it's somewhat our responsibility as legislators to vet these issues here in this forum, in this venue." A third co-sponsor, Sen. Reuven Carlyle (D - Seattle), raised ongoing concerns about the risk of executing innocent defendants. "You cannot read a front page story about DNA mistakes that has someone in jail for 35 years and not be jolted to the core," he said. "That has transformed the public's view of this issue." Governor Inslee, who imposed a moratorium on executions in 2014, described the vote as reflecting “an increasing recognition of the public that this is not an effective and certainly an unequal administration of justice and is no longer acceptable in the state of Washington.” "I hope Washington joins the growing number of states that are choosing to end the death penalty," he said. Before the final vote, Senators voted down two amendments that would have narrowed the death penalty, but not eliminated it, and a third amendment that would have put the issue to voters in a public initiative. Ferguson called on the House to join the Senate in passing the measure. The bill, he said, provided the House "the opportunity to abolish our broken death penalty." (Joel Connelly, Connelly: State Senate votes to abolish death penalty, SeattlePI, February 14, 2018; Max Wasserman, Abolition of death penalty gets closer to reality as bill clears Washington state Senate, The News Tribune, February 14, 2018; Rachel La Corte, Washington Senate passes bill to abolish death penalty, Associated Press, February 14, 2018.) See Recent Legislative Activity.